Whenever Zuzi and I travel abroad, we always try to see a movie. You can do that in Prague, too - most of the movies are subtitled, not dubbed. In addition, smaller art film cinemas are really fun and offer a truly local experience! When ex-Nobu chef, Paul Day, opened a much-praised restaurant in Prague, we could not resist being one of its first visitors. Our expectations were high… Were they eventually met?This small, down-to-earth place has both communal seating arrangement and individual tables, along with an open kitchen. Rather than spending thousands on posh furniture and accessories, they decided to go for a minimalist look, which we loved. Although some may find the interior dull, smart touches extend throughout the interior décor: the contrast between the cold surface of concrete and the warmth of the wood and vibrant flowers in vases, eye-catching bulb lams; witty The Real Meat Society (where Sansho gets its meat) coasters; checked decor on both napkins and wardrobe of the staff. Nevertheless, the focus is definitely on the food. Although the restaurant serves Asian-inspired food, it cooperates with local farmers and uses their organic eggs, meat and vegetables, and offers beer from a microbrewery. While à la carte menu is offered during lunch time, only a tasting menu is available for dinner (you can select only one dish from the menu, but the menu works much better as a cohesive whole) and it is served family-style. Quite unusual in the Czech Republic (we like our portions really big), this informal and sociable drew a lot of criticism as the restaurant opened. We opted for the six-course menu - a lovely combination of complementary flavors. The first course, Scottish salmon sashimi, was a wonderful combination of fine fish with a citrus soy marinade, fresh ginger, pink peppercorns, chives and sesame seeds that awakened our slumbering taste buds with a sweet and sour tang. Next up was a salad of green and white asparagus coated with a beautiful, aromatic dressing of coriander, mint, chili and Thai basil (and probably many more ingredients we were not able to identify) with an egg fried in goose fat. Honzi’s least favorite but still tasty dish – chicken satay – followed: tender chicken legs were covered with rather salty than sweet peanut sauce that had a little bit of heat. Crispy fried onions on the top added extra texture. 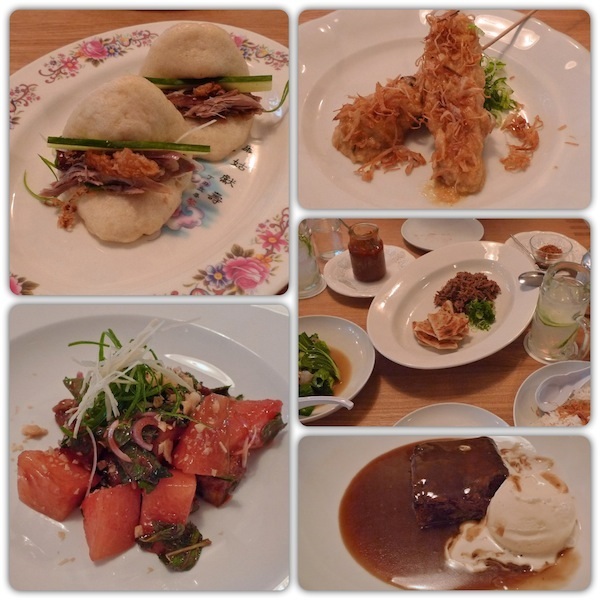 The fourth dish was duck sliders; steamed buns were light in texture and reminded us of our dumplings. Slow-roasted duck, cucumber and scallions with a little bit of hoisin sauce were stuck into the buns. While still nice, I could hardly taste the filling. Therefore, the sliders seemed the weakest dish of the night to me. Then an unusual combination of pork belly and watermelon salad “landed” on out table. This powerful combination of flavors and contrasts was wonderful. Juicy, caramelized bites of pork melted on the tongue and paired beautifully with the sweetness of fresh watermelon that removed the heaviness of the dish. The standout of the evening was the final dish, the 12-hour cooked beef redang. The meat was slowly cooked in coconut milk with lots of spices (we bet there was chilli, ginger, galangal, and lemon grass) and was so tender that you could eat it even if you had no teeth. Crunchy toasted coconut and a jar of homemade hot jam were served on the side. It came with steamed rice, roti and wok-fried broccoli and bok choy with fish sauce, ginger and chilies. Already stuffed, we decided to have desserts. Sticky toffee pudding was served warm with vanilla ice cream on the top. It was delicious, super rich and Honzi almost licked the plate clean. We also tried the homemade passion fruit ice cream with pink peppercorns. Yummy. It was not a cheap meal. If you eat and drink as much as we did you could easily get to EUR 40 per person. There are certainly places where you can spend less in Prague, but hardly any of them pays so much attention to every dish. For that reason, we think it is definitely worth it. Listen to an interview with Sansho's chef, Paul Day.